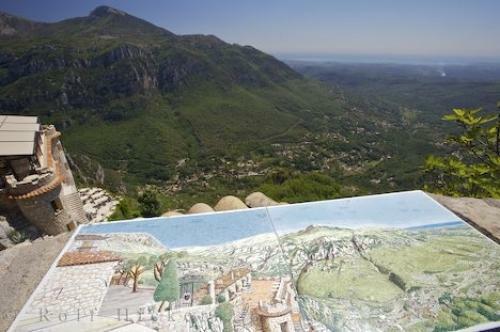 A detailed picture of the Gorges du Loup in the forefront displayed at Place Victoria in the village of Gourdon, France where you overlook the magnificent valley below. While in the village of Gourdon in France, Europe stop at Place Victoria where you have a spectacular view of the Gorges du Loup and the Mediterranean Sea. Place Victoria in Gourdon, France is a peaceful and beautiful spot to relax, have a cup of coffee and some munchies as you enjoy the French Riviera landscape.Gourdon, France has plenty of days of warm sunshine and the outside cafe known as Place Victoria is a main destination in Gourdon where many tourists visit. The village of Gourdon, France has an amazing amount of flowers that blossom around the village so it doesn't make any difference where you decide to sit at Place Victoria, the scenery is incredible from every angle.Queen Victoria once visited the village of Gourdon and thoroughly enjoyed her tour, especially Place Victoria, so the locals of Gourdon named it Place Victoria in her honor.View of the Loup River Valley and Gorges du Loup from the square - Place Victoria in the village of Gourdon, Alpes Maritimes, Provence, France, Europe. Photo of the outstanding scenery of the Gorges du Loup from Place Victoria in Gourdon, France in Europe.